-Dr. Flavio Rasetto, Prosthodontist, Chevy Chase, MD. -Dr. Okan Damar, General Dentist, Easton, MD. -Dr. Keith Progebin, Prosthodontist, Washington, D.C.
-Dr.Andrew Orchin, Orthodontist, Washington, D.C.
-Dr. Ricardo Perez, Pediatric Dentist, Chevy Chase, MD. -Dr. Jill Bailey, General Dentist, Washington, D.C.
-Dr. Peter Savramis, General Dentist, Chevy Chase, MD. 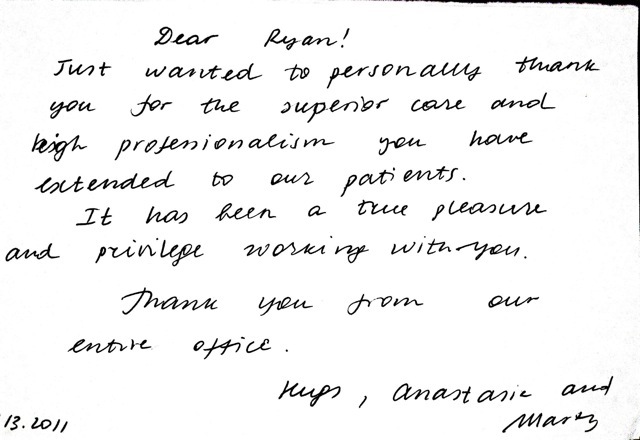 “Very easy to schedule patients for procedures and great communication on patient progress. -Dr. John Kelly, General Dentist, Bethesda, MD. -Dr. Ali Sarkarzadeh, General Dentist, Rockvile, MD. -Dr. Reginald Cole, General Dentist, Bethesda, MD. -Dr. Nick DiBenedetto, Restorative Dentist, Bethesda, MD. -Dr. Richard Fordjour, General Dentist, Washington, D.C.
-Dr. Marty Levin, Endodontist, Chevy Chase, MD. -Dr. Brian Gray, General dentist, Washington, D.C.
-Dr. Andrew Orchin, Orthodontist, Washington, D.C.